Ullu Baraaye Farokht Nahin – Owls Not For Sale – an intriguing title for sure, but not the kind to get viewers all excited and have them counting down days to its premier – nope this was definitely not one of those. On the other hand, to give them credit, the writer, director and producers should be applauded for having faith in the audience, not giving up on creativity and staying away from depressing titles, which make no bones about the thakan the viewers will feel and the ashks we will shed after going through 23-24 weeks of the endless saga of the mazloom aurat and her daaghs, with no rehaai in sight and no hope of a gulzar zindagi. Right off the bat, therefore, I was inclined to give this one at least one serious dekho. Adding further mirch to the masala was the brilliant OST and the fabulously done promos. The sneak peeks into a feudal rural milieu, very different from the urban settings of our regular serials, the colorful characters, the superbly shot interiors and exteriors, all gelled together really well, and I knew what I would be doing Tuesday evening – watching Ullu Baraaye Farokht Nahin. Having just watched the first episode, I can happily say that my anticipation was not in vain. Right from the very first shot, two college friends, who for once looked age appropriate, it was easy to get sucked into this world which writer Amna Mufti and director Kashif Nisar seem to have created so effortlessly. Seamlessly moving from the city – a very well done classroom scene of Asiya going gaga over her appropriately drool worthy English Lit Professor – to the rural landscape of interior Punjab, the two tracks were well-knitted and the transition very smooth. Any discussion of the rural track of the story will remain incomplete without first acknowledging the fantastic haveli in Kasur, Punjab, which, much like Ashar’s house in Humsafar, is as important a character here as any of the other actors. In the gaon, once again, like in the university scenes, the depictions of everyday life and the naturalness with which the actors tackled their characters was quite remarkable. Watching a squatting dhoti clad Nauman Masood dressing a bloodied game bird while carrying on a regular conversation with his maayi baap, Nauman Ijaz reclining on a charpai, while Saleem Mairaj played the flute, was one of those moments that will stay with me for a while. Without giving away too much, at the heart of it all this is a saga of a long-standing family feud between two landowning brothers, Mir Ghulam Yaqoob Malkana and Mian Sahab. Yaqoob has three daughters, Kaneez Fatima, Nazeer Fatima and Asiya, and one son, Ghulam Fareed. Mian Sahab, the younger brother, had two sons, Ghulam Rasool, who was murdered, Ghulam Ali, and one daughter, Gul-e Rana. As an opening chapter, the first episode was fast paced and action packed as we got quick insights into each of the character’s layered personalities. The director was particularly successful in laying out the complex web of relationships between the two feuding brothers and their families. Often times such stories are easy to explain on paper, but hard to actually translate on to the screen, but this was really well done here. The writer and director seem to share a similar sensibility, so Amna’s compelling story looks that much more meaningful with the visual narrative backing her words beautifully. The DOP Rashid Abbas deserves special mention for capturing the spirit of the story so well. Among the actors, Nauman Ijaz owns every role he does, so its no surprise to see him doing well here. Sohail Ahmed is absolutely fabulous. I cannot say enough about the lethal combination of oily hair, surma-ed eyes and facial tics, but to his credit he gives a very controlled performance, keeping OTT-ness strictly in check. The chess scene, where Mian Sahab’s son comes to talk to him about the quarrel between the two brothers was beautifully done. Nauman Masood, Omair Rana and Saleem Mairaj were all very convincing in their parts. Among the ladies, Saba Qamar was good. Irsa Ghazal surprised me with her complete transformation and her power-packed performance. After having seen Hina Bayat in Talkhiyan and Irsa here, one cannot but help but be saddened at the thought of so much talent being wasted in one formulaic story after another. Yamuna is another one who really impressed here. The actress playing the maid servant (sorry don’t know her name!) was also very good. Overall this was an impressive start. Ullu Baraaye Farokht Nahin holds out the promise of being something different, kuch alag. Looking forward to seeing how this one unfolds! Her name is Uzma hassan and I think she was very good in episode 1, the way she says, ke din bhar to kaam karti hun, raat to meri apni hai. When she meets noman Ejaz on chat, the look she had in her eyes spoke to volumes and i could understand what was going on between them. When Nauman Ejaz was shedding tears (awesome act) the expressions Uzma had were fantastic… Over aall great job done by all. Well done Amna Aapa. @Faysal Manzoor: Thank you for taking the time to read and comment and help out with Uzma’s name – much appreciated! Indeed she has impressed here.. looking forward to seeing how her role plays out here! Hey SZ , when I read the title , I didn’t take it seriously but now reading the review I think I’ll give it a shot . Seems like a promising serial ! The ullu is cute , reminds me of Hedwig ! Huge thank you! 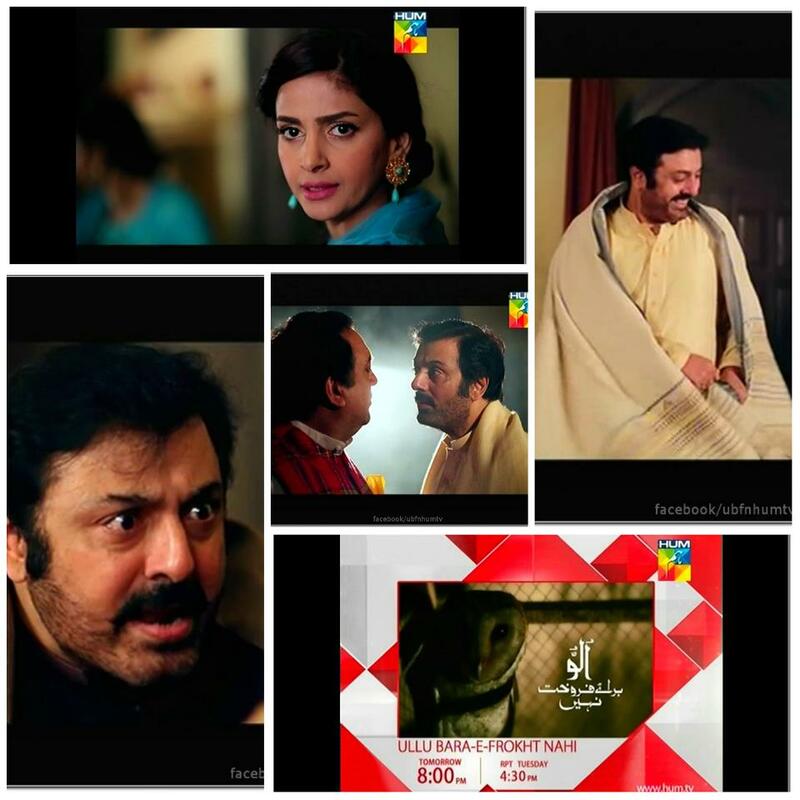 as all credit goes to you for letting me know about this drama by sharing the OST on your FB page… and with good expectations i heard the ost and no doubt it was beautiful, loved it.. from then was looking forward to this unique named drama serial..
@Rehmat: Yes, the pigeon scene and the Nauman Ejaz’s fake tears were really good! Lets hope the rest of the serial lives up to the very promising first episode! SZ, I’m glad you’re watching and reviewing this one too. The OST hooked me into giving it a shot and because I love Saba Qamar I’ll stay with it for a few more epis at least. Ditto your observation about the college kids actually looking their age for once. 🙂 Just hoping it doesn’t become the formulaic story of evil land owners vs virtuous peasants. finally saw this 🙂 yes, it’s intriguing, will try to catch 2nd ep tonight. Loved NM doing the ‘dressing’ as u say- to the bird- icky but ok if he doesn’t mind! NI is always good (FK, maybe you should be doing some roles like these here, enough of ZGH types). btw , what other shows has amna mufti written before? @Afia: Hey! Thanks for checking this out on my recommendation – will wait to read your comments on the next two 🙂 Yeah that was a memorable scene indeed! If I remember correctly, Amna Mufti’s written Sabz Pari Lal Kabooter, Madiha Maliha, Jahez and Maya among others …. So I’m finally watching this, and I’m so excited. The first episode was brilliantly paced and really ramps up the anticipation for the rest of the story. I think it’s interesting that this seems to be the same story of feuding feudals, but it’s executed really well. Maybe that’s all you need to tell a good story? It was a treat seeing Noman Ijaz being sort of a baddie and chewing scenery with such gusto in that scene by Abbaji’s death bed, and even though their interaction on the terrace was so short, NI and Uzma Hassan sold what’s going on between them perfectly. Also Omair Rana reciting Shakespeare and looking all fabulous and nerdy as the English Literature professor was awesome. (What do you know, it’s like an SeMM reunion, except before SeMM, lol). It’s a bit weird that Yumna Zaidi’s character here is almost the same as her character in Pinjra, down to her first name. Same director, right? (Did you notice that Miyan Sahib’s haveli is the same as Barrey Sahib’s haveli in Numm? It’s like that show is following me around!). RK…I just finished this drama and too be honest as usual I was dissapointed by the last episode. In my opinion it went down hill somewhere in the middle. The drama picks up pace around episode 20 only to conclude everything in a rush in ep 25. In my opinion Sannata which I believe aired around the same time with also the same Director was a better drama. Looking forward to your opinion once you finish 😊. I just checked….Sannata came one year later on ARY. Def recommend that over this one!